After 10 yrs. trading, this is the best I've seen yet. I have been trading for about 10 years. I've traded with 5 or 6 different "live" trading rooms, and I still chat and "live trade" with two other groups occasionally. But, with Elite CurrenSea I am getting the best trades and the best instruction ever. I really like Nenad who uses a system (CAMMACD). I haven't bought the system yet, as it is a little pricey. But, I think I will. The reason I say that, is that I paid a small amount for a one month experience, including training, live interactive webinars, and trade signals sent to my desktop and cell phone. Last week, we had 7 out of 7 trades positive...no kidding. We have three to four live webinars, almost every other day. Now, every real trader knows that you are not going to win all trades. But, Nenad's trade selection is really good, and the entries are very good, with limited drawdown and good SL placement (good risk vs reward). And...you get real trade management help until the trade is done: Entry, SL, TP, and an instant notification when to move your stop to BE, and when to scale out of the trade. To be able to experience the service in it's entirety FIRST, and the consider spending more later, is as good as it gets in this business. The start of their service saved my attempt to become a trader. Since then I understand these processes better and take advantage of them. Nenad and Chris have high level of knowledge, hard working and have a fair way of thinking. I am greatful that they put energy into education and trading signals instead of simply trading by themselves. Jun 30, 2018 - 5 Stars ESC guys are professionals, professional trainers and they work hard for their subscribers and their company’s future. One must be fool or a maniac to make losses by following their trade setups. I trade for several years but after six month of working with them, I have a seriously more clear picture of what is happening. I'm following Chris and Nenad for aprox 4 months and they really provide great trading setups and educational materials. I also follow them on forexfactory.com where they are very active, I like how Chris explain potential trade setups and his technical wave analysis. I attended their FX & CFD SEMINAR and I absolutely recommend this to anyone. Super happy to be working with these guys. What's amazing about ECS is that they are fully committed not only towards being able to provide quality signals, but to really provide quality education and build the people who follow them to be able to analyse charts and take clutch trades. Personally, my life as a trader was redefined by watching all of Nenad's webinar when he is still at AM. These guys at ECS, Nenad and Chris - they are not selfish to keep good knowledge to just themselves and the inner circle, but their vision is towards leaving a legacy - generations of people who would find success and passive income through trading FX, and to build the FX community as quality contributors as well. The proof is in the pudding. Just look at their education materials, pre-fact, in-depth analysis at elitecurrensea.com and it's hard not to be blown away. Best thing is, whether you are a positional trader, swing, day, or scalp trader, full support is given via their ECS.Live service. NKT is a highly talented, sought after speaker in the community with years of trading experiment on his back. And like I always say, Chris is a one in a generation miracle wave analyst, not any less committed to the same cause - and as a subscriber their services for coming to half a year, I really could not be happier. Not only profits wise, but also the support that is offered on weekly recaps and close follow ups vis DAILY webinars where their face is shown and they will be interacting, explaining, taking questions live. Love NKT's analysis and Chris' in-depth wave + fundamentals analysis. I cannot put more emphasis on this. In a community full of scams, where transparency is valued at its utmost. Not only are they good, they are accountable, faithful to their subscribers and transparent - just look at their myfxbook equity curves. 5 stars for credibility. Resources wise, they have everything a newbie trader needs in the journey to go pro. Free services include NKT's trademark Price Action Trading School I and II (PATS I and II with free system giveaway) as well as pre-fact analysis, in-depth wave analysis by Chris and also learning resources for the new trader ad the advanced. Not compiled in complicated hieroglyphical jargon, but presented in simple trading solutions (NKT's ECS.CAMMACD) and cheat sheets (Chris' E Wave Core Reference Guide and NKT's Master Candlestick guide). Ergo, with them, complicated things become simple. Simple. Clean. Profitable. For new traders they also have their own list of trusted brokers, the first step towards starting on the right foot and hold on a minute.. if you sign up with one of their trusted brokers, BOOM! You get free LIVE services, education, webinar for a period of time to try them out before you sign up officially with them. And trust me, you will - I personally started their free services vis trusted broker haha! GO check them out. They're an awesome bunch, you get 2 perspective of the markets CAMMACD and Wave analysis, so you enter the markets with a clear mind... and talking about clear mind, NKT has been giving risk management and market psychology classes ever since IB days, and is still committed to doing so, all for the profitability and individual sustainability for the FX community. While risk management may be the only holy grail of trading, the 2nd holy grail imho, is their proprietary CAMMACD and SWAT. Look, I'll save the best for last. Don't let me spoil the best part for you. Go to their site and check it out. 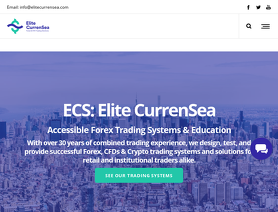 All in all ECS as an independent organisation, is fully committed to the profitability of their traders, as well as the growth and generational legacy of the FX community. That's my review guys. I don't know about you, but they have my loyalty especially when it comes to the matters of FX and trading. Don't see myself leaving anytime soon!. Never been more pleased with the results. P.S. Also guys, the price on cammacd.mtf is really underpriced and they're thinking of increasing it. And they should. 1700 is an understated cost for limitless lifetime profit and support. Not to mention that BEFORE that, it was costing 8999EUR, reduced for the community. Institutional grade. Extremely pleased with it. Lastly, wanna thank ECS for always being faithful, giving us the best signals, analysis and education ;) stay on fire guys! I started a year ago and happy that i get involved in trading. Nenad and Chris helped me a lot to understand what is going around in Forex markets. Im still learning. My trading is improved a lot. As they say Patience and you will become great trader.Thank you for your sharing. EliteCurrenSea (ECS) gives what I didn't find in any other advisors, blogs, experts, etc. - not just some "magic" trading system or market analysis but the holistic view and support for the trader - from beginner to advanced level. First, they teach you trading basics and psychology, then gives instruments (indicators, explanations, trading systems) for everyday trading, then - provides constant support (answering questions, providing everyday market analysis, trading system updates, blogs, channels). They not just sell you some instrument or service - they support you while you're trading and when you need advice. I'm trading with ECS more than year already and definitely will continue! They provide you with knowledge to trade. Professional and skilled. Best teachers you can get as a novice trader. If you don’t want to crash and burn. Learn from these gurus, and follow their advice. I’d vouch for them. I learned a lot from them. I think trading is one of the hardest jobs in the world, so it's important to learn from experienced and successful traders.